Are you worried about making costly tweaks to your AdWords campaigns? Well, that worry is over with Campaign Draft and Experiments, Google’s Adwords split testing platform. Here is everything you need to know about setting up and running campaign drafts and experiments. More and more businesses are turning to Google AdWords. Because it works. So much so that 72% of AdWords marketers plan to increase their PPC budgets. But in order for it to work so well, marketers have to set up and manage those ads correctly. That means choosing the right variables and tweaking them over time. Luckily, each tweak doesn’t have to come with high (and expensive) stakes. 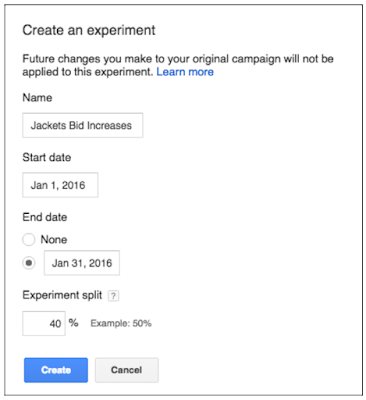 Instead, Google allows you to run experiments before applying changes to existing campaigns. This article covers everything you need to know about how to set and run your own AdWords experiments. So what is an AdWords campaign? Put simply, it’s an ad campaign run through a Google AdWords account, usually composed of a group of ads. Ads are generally grouped by product type or location, with each ad in a group usually targeting a separate keyword. For example, at Ignite Visibility we offer SEO, social media, Amazon optimization services and much more. So, we could choose to run a different campaign for each service. In fact, Google Economic Impact Report shows that businesses make an average of $2 in revenue for every $1 they spend. Exactly How Expensive are AdWords Campaigns? Google AdWords gives you control over how much you spend. There’s no minimum amount required; rather, you set daily a budget for how much you intend to spend. While there are multiple bidding strategies to choose from, most stick with CPC (cost-per-click), which means you pay every time someone clicks on one of your ads. So, if you set your daily budget to $5, the most you will send that month is $150 (based on a 30-day month). Of course, other factors do come into play – most notably how expensive your chosen keywords are. Generally speaking, the more competitive the keyword, the more you’ll spend per click. For a deeper look at how AdWords bidding works, take a look at this video. Is Google Adwords Worth the Investment? If you want customers to find you, that is. That’s because 86% of customers use the internet to find a local business. But because campaigns can get costly, many hesitate to make significant changes to existing campaigns – especially those that have proven successful – without knowing the change is worth the investment. Which is why first, you do a test run. Campaign drafts and experiments were introduced in February 2016, and give the advertisers the ability to test changes to their campaigns before pushing them live. Originally Google offered AdWords Campaigns Experiments, which was retired in favor of the new Drafts & Experiments function. AdWords Drafts and Experiments are available exclusively for Search and Display Network campaigns. Drafts allow you to prepare changes to a campaign without impacting its performance. They’re a replica of your original ad setup where changes and updates can be applied before they go live. Drafts are often created to show clients or bosses how potential changes will impact a campaign. For example, if you’re tasked with updating the strategy of an existing campaign, you can use drafts to show how changing different features will impact the overall result. From there, drafts can then be applied to an experiment or the actual campaign. You may create up to 5 drafts for the same campaign, though only one can be used as an experiment at a given time. Note: Campaign drafts are used to create an experiment, and are different than those created in AdWords Editor. Experiments are the middle-man between drafts and live campaigns. Once you’ve created a draft, you can choose to run it as an experiment before applying it to your actual campaign. The experiment functions just like a campaign. First, you set how long you would like the experiment to run and choose how much of the original campaign’s budget and traffic you’d like to use on it. Then, when a prospect lands on a search page, Google will randomly whether your experiment or actual campaign appears, based on the split you selected. Throughout the AdWords experiment advertisers can monitor results on their performance scorecard. If you’re happy with the results, you can apply them to the existing campaign, or convert the experiment into a new campaign – with the same dates and budget – while pausing the original one. If not, no harm no foul. You can continue the original campaign and choose to run a new draft as an experiment. Google notes that it comes down to personal preference when choosing how to proceed after an experiment, though the majority of the time you’ll probably want to update the original. Doing so will apply all changes to the original and keep the campaign’s history intact. Converting will add a new campaign to your account, causing you to lose the original campaign’s pre-experiment history. Users will find many benefits associated with the Drafts and Experiments function. One of the biggest is certainly the ability to test campaign effectiveness while risking less of your budget. This is especially true if the campaign in question has already proven successful. Understandably, many would be reluctant to gamble on a new strategy. But with Adwords Experiments, you can share a small portion of your already-established budget to test the new direction. If it doesn’t work there aren’t any extreme repercussions; simply discard the draft. If it does, you’ll have the confidence and proven results needed to move forward. Another pro: It gives multiple people the ability to make changes to an ad campaign. That means if you work with multiple people – think copywriters, managers, SEO specialists – everyone can go in on their own time and make changes to the drafts. And of course, the feature eliminates much of the guesswork often involved with significant ad changes by allowing you to show a preview of all changes before they take place to key decision makers. Like most of Google’s user functions, the process here is pretty intuitive. To begin, you’ll need to have an existing campaign running in AdWords. Simple as that. With just a few clicks, you have an updated campaign ready to go. If instead you decide to run an experiment on one of your drafts, you’ll again want to start by logging into to your AdWords account. If at any time during the duration of the test you are unhappy with the results, you can close it out by simply changing the end date. But hopefully, you find your experiment successful. In that case, you can choose to apply the experiment to your original campaign. Or, you can convert the AdWords experiment into a brand new campaign if you wish to keep the original as is. Doing so will pause the original. The ability to test can be a huge time and money saver, as long as know what to test. Using the AdWords Experiments to perform A/B tests will help you find the right combinations and drive the highest conversions. For AdWords, Google recommends focusing on high-value levers. Though not an exhaustive list, the factors above could have big impacts on your ad performance. Which you ultimately decide to test will depend on company or client’s overall goals. You’ll want to keep close tabs on the success of your experiment throughout its run. Luckily, Google makes it easy to do so. In your AdWords account, you’ll find a performance chart under the All Experiments header. This is where your experiments performance can be monitored, with arrows used to show which metrics are performing better or worse than your original campaigns. Google offers a full breakdown of how to use and interpret the charts here. Wait for enough data to be confident in your results. Google uses an arrow system to show you how confident you should be. Three arrows are the greatest (greater than 99.9% statistical significance). No arrow signifies there isn’t enough data. Check for outliers in your top-level experiment outcomes. Data is summarized at a high level, but don’t stop there. According to Google, it will only take a few seconds to scroll through and see if the performance of your ad groups aligns with the top level results. If you find any results that are different than reported in the initial result, it’s something to look into. Implement what you’ve learned in future campaigns. As noted by Google, updating your strategy based on what you’ve learned is the most critical part of any experiment. Use what you’ve learned to guide future campaigns and optimize current ones for best results. Keep records of your past experiments. This one could save you a lot of time in the future. Keep records through your AdWords account or collect them in a spreadsheet to refer back to when creating and testing future ad campaigns. If you’re using AdWords, there’s no reason you shouldn’t be running experiments. It’s a fantastic tool for testing and optimizing each campaign for the best results possible, without any of the commitment that comes with a blind change.